In addition to degree-granting schools, Alabama also has a wealth of postsecondary institutions offering certificates or degrees that can take less than two years to complete. While these types of institutions may vary in their offerings, they are most likely to offer career training instead of traditional degrees, and most aim to place students in a profitable career as the end result. 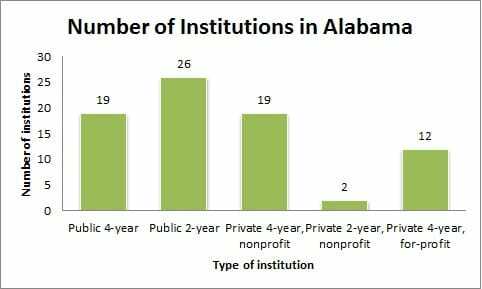 According to a 2014 NCES report, federal financial aid-eligible colleges and universities in Alabama granted 63,775 degrees and certificates to graduating students in 2011-12. Among those students, 72 percent earned their degrees at four-year institutions and 27 percent earned two-year degrees. The remaining 1 percent, which was comprised of 712 graduates, earned certificates from institutions that offered less-than-two-year degrees. Total Spring 2013 enrollment in the Alabama State University system was reported as 60,696 in 2013, including students at the three major campuses-Tuscaloosa, Birmingham and Huntsville. With the popularity of online education on the rise, plenty of colleges in Alabama have gotten on the bandwagon, much to the benefit of their students. The addition of online courses and degree programs has been a major boost to students who need the flexibility to complete their studies on their own time and at their own pace. Meanwhile, innovative new programs, like online and hybrid degree programs, have brought new students into the higher education fold, which has been highly beneficial for universities in Alabama as well. Several other universities in Alabama have achieved impressive rankings from U.S. News and World Report and other notable publications. Meanwhile, not all programs are ranked for superiority and affordability, so it's important for students to conduct their own research before deciding which program is a good fit. Fortunately, Alabama students have plenty to choose from when it comes to online degree programs in their state. In fact, the University of Alabama system, the state's largest, offers a vast array of bachelor's, master's and doctoral degrees that can be earned online and in the comfort of your own home. And other schools, including small, private schools and larger, public universities in Alabama offer their own take on online or hybrid education. According to figures and projections from the U.S. Department of Labor, employment for occupational therapy assistants is expected to surge 50 percent in the state of Alabama during the decade leading up to 2022. Meanwhile, occupational therapy assistant typically need an Associate's degree to get started in this field, which means quicker entry into the workforce upon graduation from an accredited occupational therapy assistant program. Compassion, attention to detail, flexibility, interpersonal skills and physical strength are all essential attributes for this job. The ability to keep excellent records is also helpful, as is the ability to work with a wide range of personalities and patients with different scopes of ability. The knowledge required to perform clerical or administrative tasks is also helpful. According to the U.S. Bureau of Labor Statistics (BLS), most occupational therapy assistants begin their careers by earning an Associate's degree from an accredited occupational therapy assistant program. In addition, most workers in this field must be licensed, although requirements vary by state. Students interested in this field can start by taking courses in biology and health in high school. Meanwhile, volunteering in a hospital or occupational therapy office is a great way to gain some relevant experience. The U.S. Department of Labor predicts that jobs for diagnostic medical sonographers will increase 45 percent in the state of Alabama from 2012 to 2022. That could mean an additional 500 jobs added during that timeframe, which is attractive to potential students. Meanwhile, the fact that workers in this field only need an Associate's degree to get started remains an attractive feature for students who hope to join the workforce quickly. Diagnostic medical sonographers need excellent hand-eye coordination as well as physical stamina to accurately get the job done. Meanwhile, interpersonal skills, sensitivity and an attention to detail are excellent traits for potential workers in this field. The BLS notes most diagnostic medical sonographers need an Associate's degree in diagnostic medical sonography in order to find work in this field. Students considering this career should take anatomy, physiology and mathematics in high school, as well as seek out volunteer opportunities in medical facilities such as hospitals or long-term care facilities. The U.S. Department of Labor predicts rapid growth for professionals in this field. Specifically, they predict a 43 percent increase in employment for physical therapy assistants in Alabama from 2012 to 2022. Physical therapy assistants need compassion for patients in their care who are likely to be experiencing discomfort or pain. Attention to detail and manual dexterity also help, along with interpersonal skills and administrative or clerical skills. Computer skills are also helpful since many job-related tasks in this field require the use of technology. Most physical therapy assistants need an Associate's degree from an accredited physical therapy assistant program. Candidates may also need to become licensed, although the specific licensing requirements do vary by state. Because of the huge demand for translation services, the U.S. Department of Labor predicts demand for interpreters and translators will increase 37 percent in Alabama from 2012 to 2022. That kind of growth remains a big draw for students who may be interested in learning another language and joining this expanding field. Business skills, concentration and cultural sensitivity are some of the most important qualities for individuals who work as interpreters and translators. Meanwhile, the most important skill or ability is absolute fluency in at least two languages, both in written and spoken form. The BLS notes many jobs for interpreters and translators require a Bachelor's degree. However, the most important requirement for this career is fluency in at least two languages. Students interested in this field should consider pursuing a foreign language or English degree, as well as focus on learning their chosen languages inside and out. Growth in this field is expected to be healthy during the next decade. Specifically, the U.S. Department of Labor expects employment for meeting, convention and event planners in Alabama to see a 34 percent surge from 2012 to 2022. The ability to work with people, often independently, is another attractive feature of this job. Workers who love fast-paced work and who thrive in an ever-changing environment flock to this type of career because of the autonomy and excitement it can provide. Excellent communication and customer service skills are essential for this job since these workers spend a great deal of their time dealing with clients and vendors. Attention to detail, composure and negotiation and problem-solving skills are also crucial since meeting, convention and event planners must learn to manage every aspect of a wide range of social events and functions. Most employers in this field prefer to hire workers with a Bachelor's degree and some experience in a hospitality-related field. A Bachelor's degree in Hospitality Management might be adequate for this career, as will a Bachelor's degree in Marketing, Communications, or Public Relations. While a college degree can't guarantee anyone a job, research shows postsecondary education can dramatically increase most individual's job prospects. Meanwhile, many entry-level careers require a certain type of degree, making it crucial to seek out a degree and training options in order to get started. 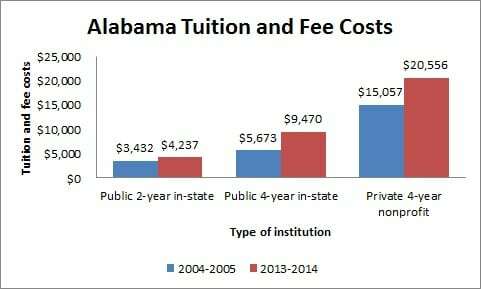 The cost of earning a degree in Alabama can vary widely due to several factors. For example, are you pursuing a degree in-state, and thus eligible for an in-state tuition discount? Or are you attending community college to pursue a two-year degree? Is your school private or public? Nonprofit or for-profit? All of these factors can make a difference, and could potentially lead to tens of thousands of dollars in additional college spending (or savings) depending on the direction a student chooses to take. Meanwhile, the costs of a college degree have increased considerably over the last decade. To illustrate, a 2014 report published by the College Board analyzes just how much costs have surged during the decade leading up to 2014. Most students preparing for a college career will be asked to fill out a Free Application for Federal Student Aid (FAFSA) form. Doing so helps schools determine eligibility for federal student aid-help that can dramatically decrease the student portion of applicable college tuition and fees. According to the Alabama Commission of Higher Education, federal aid that may be available to Alabama students can include Pell Grants, Federal Opportunity Supplemental Grants and college work-study grants. Some types of student aid may never need to be repaid, while other types of aid can come in the form of loans or guarantees. To find out more about some of the schools and programs available in Alabama, be sure to check out the ones featured in our school listings below.